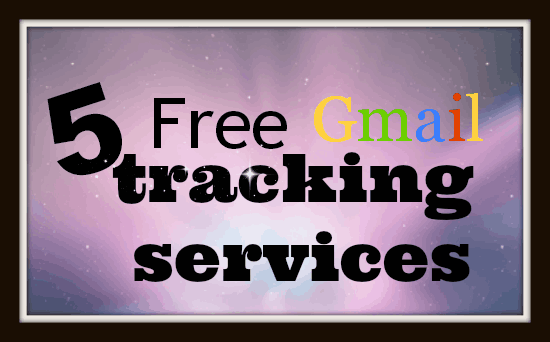 Here’s a listing of five free Gmail tracking services. These email tracking services keep tabs on your sent emails (sent via Gmail) and notify you (via different methods) when the recipient(s) open/read those emails. Apart from that, these service also notify you when a recipient clicks any link(s) in your emails. So, if you want to get read receipts for your Gmail, then these services come pretty close and provide same information. Most of these Gmail tracking services are designed for Gmail and as such, work with Google’s email services (standard Gmail and Google Apps accounts) only. However, some of these support other email services/clients like Microsoft Outlook as well. While majority of these tracking services work as standalone browser extensions (and that too, primarily for Google Chrome), but some require additional sign-ups for free accounts. Excited already? Let’s find out in a bit more detail. Firing up the list is the big daddy of email tracking, Yesware. It not only lets you track your emails (sent via Gmail), but includes a truckload of other goodies as well. Using Yesware for Gmail, you can track when your sent emails are opened/read, when the recipient clicks a link in an email etc. You can even know when the recipient downloads an attachment included with a tracked email. You also get customized email reports and templates. Available as a Google Chrome extension, the free level service of Yesware lets you track up to 100 events (emails, attachments etc.) per month. The paid level services include even more awesome stuff like Salesforce CRM integration, email reminders, and scheduled emails. If you’re looking to supercharge your Gmail experience, say yes to Yesware (Click here for detailed review of Yesware). Signals is another great Gmail tracking service that lets you keep tabs on your Gmail sent emails. However, it also works with Outlook.com, as well as desktop email clients like Microsoft Outlook and Apple Mail app. 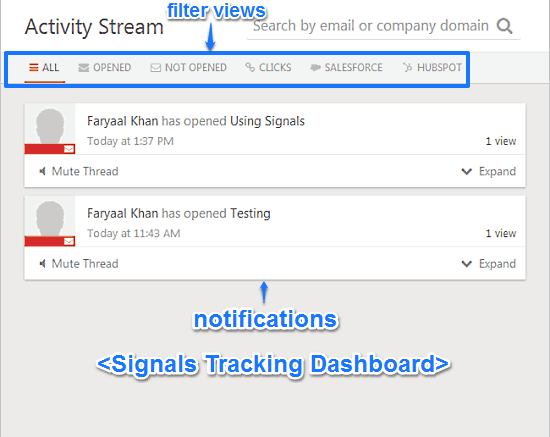 Signals let you know when your sent emails are read/opened. Apart from that, it also tracks how many times the links in your emails are clicked. Using Signals is extremely easy. Since it’s available as a Google Chrome extension, all you have to do is add it to Google Chrome and sign up for the free account with the Gmail (or other supported) address whose sent emails you want to track. 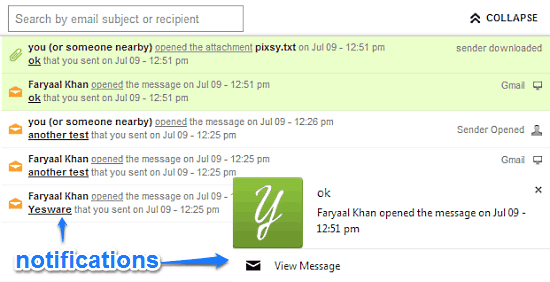 Once you do that, Signals adds an extra Track & Send button to the email compose box. You can view all the tracking activity using the tracking dashboard. The free level tracking of Signals lets you get up to 200 tracking notifications per month. Paid level account up this to unlimited, and also include features like Salesforce integration. Bananatag is yet another awesome email tracking service that effortlessly lets you track your emails. Available as both a Google Chrome extension and a Microsoft Outlook add-on, it supports both Gmail and well, any email that you use with Microsoft Outlook. Bananatag lets you track when your emails are read/opened by the recipients. It can also track whenever a recipient clicks on any link in a sent email. All of this information can be viewed as beautifully visualized email metrics (having click through rates, email successes and failures etc.) on your Bananatag dashboard. Using Bananatag is extremely simple. Simply check the Track Email option when composing an email in Gmail, and you’re good to go. The free level service lets you tag up to 5 emails a day, and supports full metrics with basic notifications (Click here for detailed review of Bananatag). 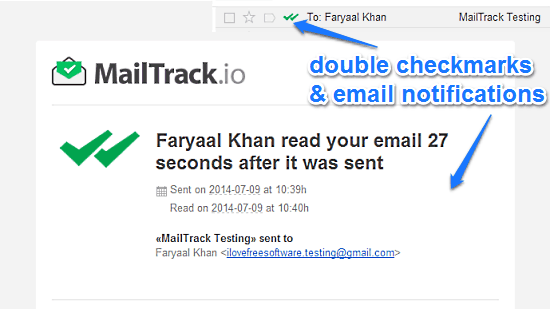 MailTrack provides simple and no-fuss tracking of your Gmail sent emails, completely free. Available as a Google Chrome extension, MailTrack lets you track as many sent emails (sent via Gmail) and see when they’re read/opened. It does this in a WhatsApp like fashion. MailTrack basically lets you know about the sent/read status of your emails via two small Green checkmarks against your sent emails. A single checkmark signifies that the email has been successfully delivered, whereas two checkmarks indicate that the recipient has read/opened the email. Apart from that, you can also choose to receive optional email alerts once your emails are read/opened. 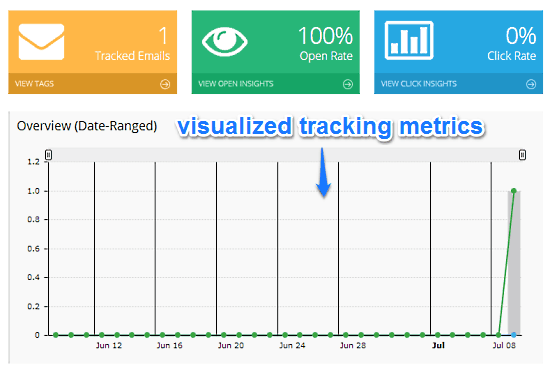 You can also a summary of tracked/opened emails, with details of their link clicks by signing on to your free MailTrack account. If you’re looking for a tracking tool that offers effortless tracking of your Gmail sent emails without a plethora of extra bells and whistles, look no further than MailTrack (Click here for detailed review of MailTrack). Rounding off the list is GetNotify, which differs from all the previous mentioned tracking services in the sense that it’s actually a tracking website, and not a browser extension. While the above detailed extensions work primarily with (or are focused on) Gmail, GetNotify works with pretty much any email service out there (including Gmail). The way GetNotify works is also quite unique. Once you’ve signed up for a free account using the email whose sent emails you want to track, simply append .getnotify.com after the recipient’s email, while composing the email (e.g. if the recipient’s email address is john@cena.com, write it as john@cena.com.getnotify.com). That’s all you have to do. Once the recipient opens or/and clicks a link in the email, a tracking report is logged in your GetNotify dashboard, which can be viewed by logging in to your GetNotify account. The tracking report includes a bunch of details like time/date email is opened, location based on IP address, browser and OS used (though this features work sketchily), and more. You can also export tracking reports as PDF. The free level account lets you track up to 150 emails per month (or 5 emails/day), and features outbox tracking history with history as well. 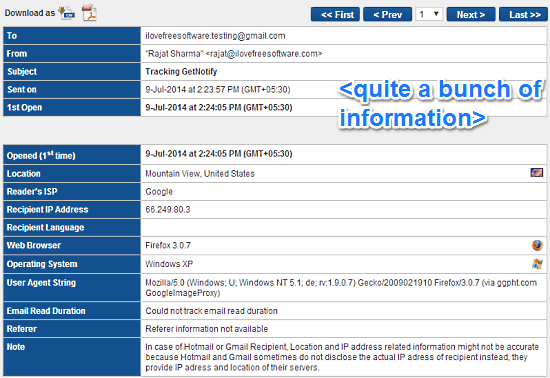 The above free gmail tracking services provide easy and effortless tracking of your Gmail (and other) sent emails. They are simple, and work the way they’re supposed to. These tracking services make sure you know whether that important email that you sent was actually delivered and read or not.